A guide to "hidden" image collections in text-based databases and other resources for finding archival images. Many text-based subscription databases also include rich image resources. This guide will help you find some of those "hidden" images and introduce other resources for finding archival images. x, 414 p. illus., diagrs., 23 col. plates. tables. 26 cm. 71 p. illus., 9 pl., 2 col. maps. 25 cm. 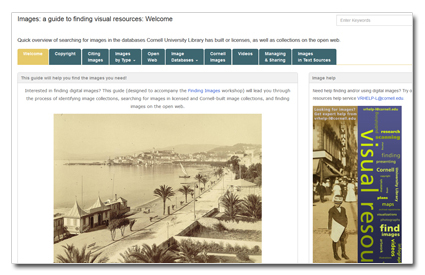 The digital image and text collections on this page are for personal, research, and instruction use only. The terms of Cornell's database licenses usually do not permit re-publication of images.